What if you actually had to shoot it? You’d want something that stops the bad guys. We’ll go over the best shotgun ammo for your home/apartment plus what to use for regular target practice. 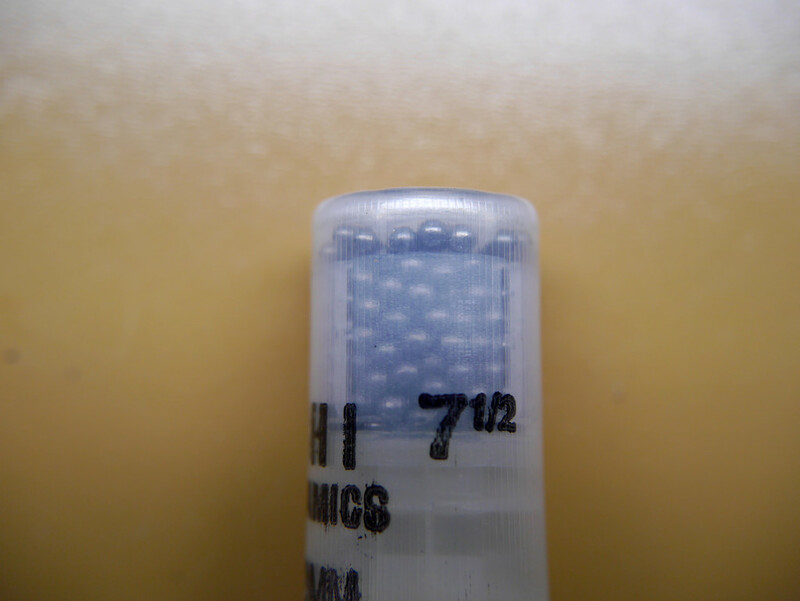 Complete with ballistics gel tests and even recommendations for different gauges. 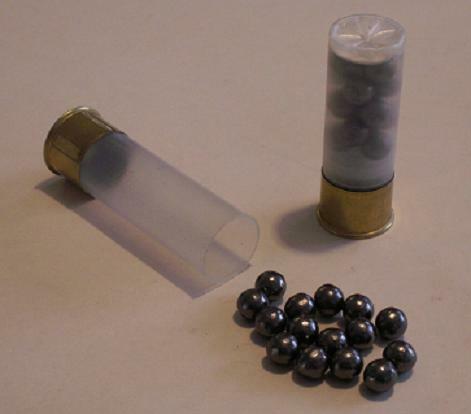 Estate #8 2-3/4″ #8 Birdshot Cheap! N/A Target shooting, training. Federal LE Tactical with FliteControl - 12 Gauge - 2-3/4" 00 Buck 9 Pellets 00 Buckshot High stopping power 20" Home Defense if over-penetration is not a concern. Fiocchi LE Reduced Recoil - 12 Gauge - 2-3/4" 00 Buck 00 Buckshot Low-recoil N/A Home Defense if standard loading is to much power for the shooter. That’s probably what you’ve heard when you ask anyone about the best home defense gun and load. But you still got to choose the correct round otherwise you’ll end up with a pissed off bad guy. Don’t have a shotgun yet? 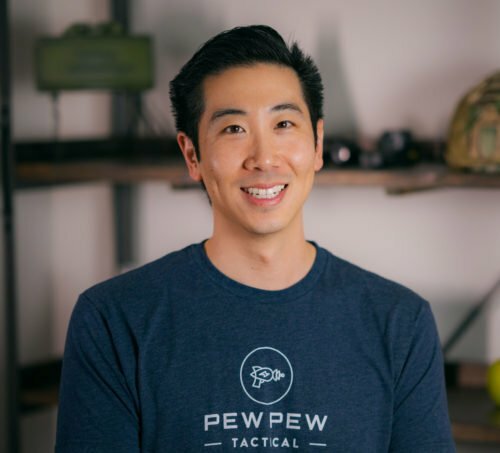 Check out our Top 5 Home Defense Tactical Shotguns first. What Makes a Good Defensive Round? 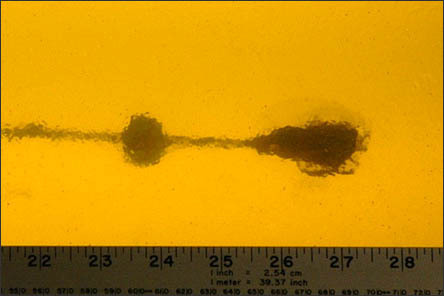 In our other defensive round reviews (9mm, .45 ACP, .40 S&W, 5.56/.223), we show examples of how the FBI conducts ballistics gel tests to test loads. However, there’s not as much good data for shotgun loads so we will have to make due with what we’ve got. 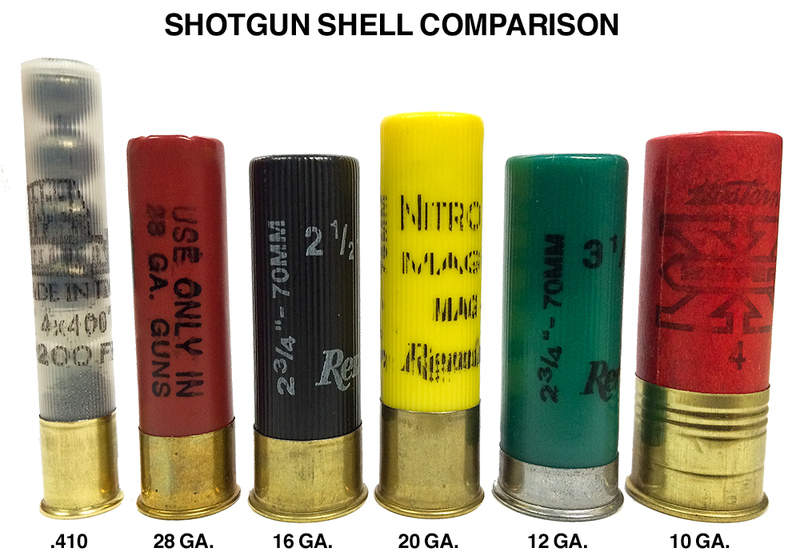 Before we do…let’s do a quick review of the three main types of shotgun loads. For a more in-depth guide, check out our Shotgun Terms article. Think lots of little BB’s that spread out a decent amount so you can hit…birds/clays. The larger the number in front of shot (eg. 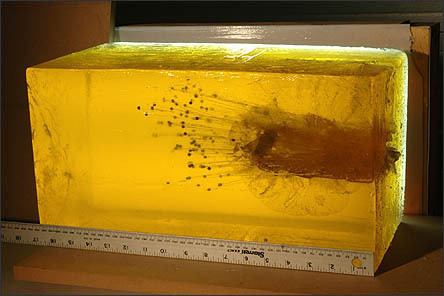 #9 shot), the smaller but more plentiful the BB’s. Also see that the shotgun is not a magical death machine where you simply aim into a room and get everyone. 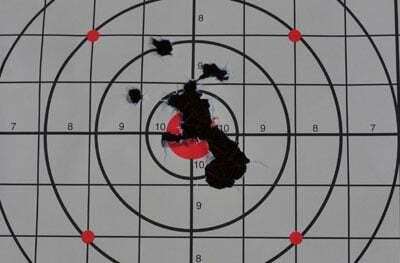 Below is the pattern of 7.5 birdshot at 10 yards. Much larger BB’s than birdshot. 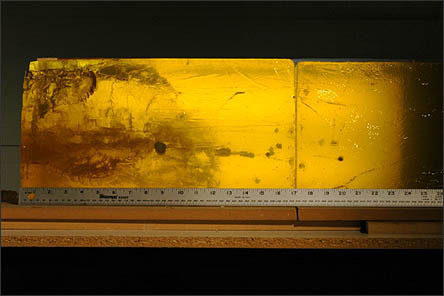 The most plentiful buckshot round is 00 buck (“double-aught buck”) which has 8-9 pellets, each roughly 8.4 mm in diameter. You don’t want to get hit by any of those…let alone 9. Again, larger numbers of buckshot (such as #1 or #4) get increasingly smaller pellets. While more 0’s get bigger. Made for hunting and self-defense. Buckshot requires pretty good aim. Check out standard 00 buck at 10 yards. One big piece of metal (usually around 1 oz). Great for well-aimed shots and has decent distance as well. I’ve had to ring steel at 120 yards for some competitions and although it’s hard…it’s doable with slugs. Great for hunting and shooting at clays but not the best for home defense. If you read around more you’ll likely see that some people suggest #4 birdshot if you’re afraid of thin walls and adjacent family/neighbors. 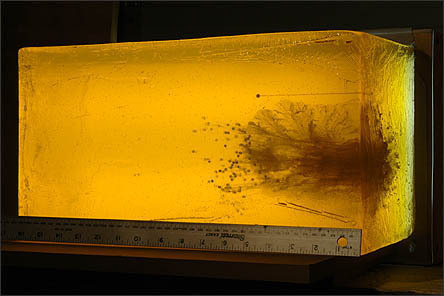 But let’s take a look at the ballistics gel data I got from TTAG which got it from a now defunct page. You can see it differs from the FBI protocol so we’ll have to adjust. 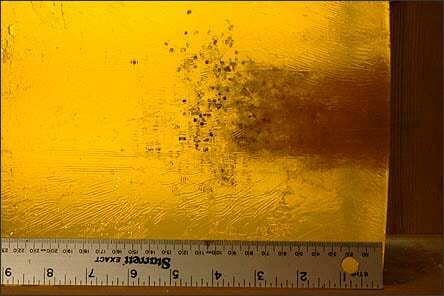 You can see the #8 birdshot does not penetrate the recommended 12-18″ even without clothes in front. #4 birdshot (which is much bigger) fares only slightly better. Better…but just at the lower cusp of what is deemed acceptable. And still without clothing. Looks like it will leave some pretty terrible wounds but not guaranteed to stop the baddie with hits to important parts. Especially if they are bundled up. Let’s take a look at #4 buckshot. It looks pretty good…with what looks like 14.5″ penetration. What we would deem the minimum acceptable load. Just nowhere near the ammo selection of 00 buck. How about if we go with #1 buckshot? 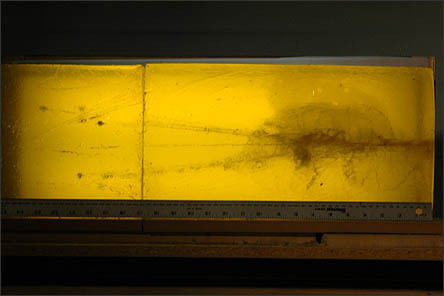 The #1 buck exhibited an average of 16″ penetration and the testers needed another block to catch all of the 16-pellets of .30 caliber lead death. However, not that many choices when compared to 00. Now how about the tried and true 00 buckshot? 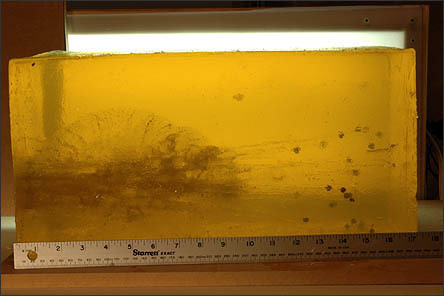 This not-that-great picture shows what is an average of 20″ penetration. 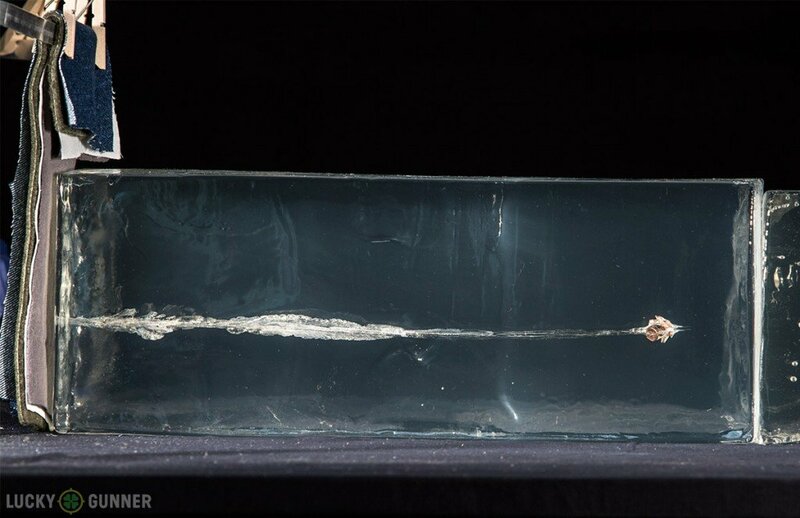 Given the lack of clothing in front of the gel, we can guesstimate that it likely will fall towards the upper end of the 12-18″ penetration sweet spot. Good stuff! Go with the trusted names of Federal Vital-Shok and Federal Power Shok. Not the best or much choices, but the minimum of what we would consider as a good shotgun defensive round. Maybe consider if you have really thin walls in your apartment. I’d go with the Winchester Super-X. The next step up and maybe the Goldilocks round (just the right amount of penetration). Lots more choices here that directly cater to self-defense. I like the Federal Tactical LE with Flight Control if you have the aim or the other Federal brands for a more standard 00. A personal favorite and what I use is the Winchester Military version. Lots of oomph though! Might be a great balance between power and recoil. I haven’t tried these out but there are great reviews for both Remington and Rio. 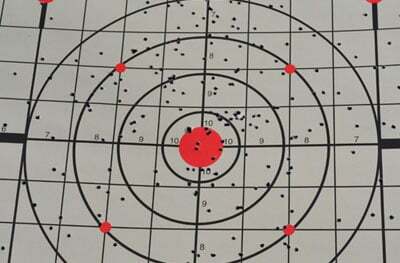 What’s your take on buckshot for self-defense loads? Ideally, you’ll practice with what you might have to use at home. But it does add up. I like Wolf 00 for everything affordable. Definitely, overkill unless you have perfect aim and no neighbors for some distance. Yup, you read that right…it’s around 27″ of penetration. Great for hunting/protection against bigger critters…but not of the two-footed humankind. A classic of the ages and ready to stop any threat you put it up against. Normally a cheaper option, but still reliable and accurate. If you need something with a little less shoulder mashing kick, this is for you! 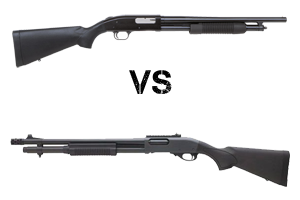 Up til now, we’ve focused on the 12 gauge, which is by far the most popular. I’m not super familiar with the other gauges so I’m following the recommendations of Internet Armory. Weak caliber…even with slugs. Avoid for self-defense. Great for smaller stature people. 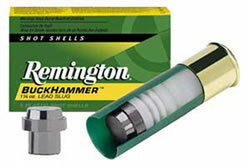 The smaller 20 gauge delivers 70% of the lead with a 40-50% reduction in recoil when compared to 12 ga. There you have it…our recommendations for the best shotgun ammo for home defense and target shooting. 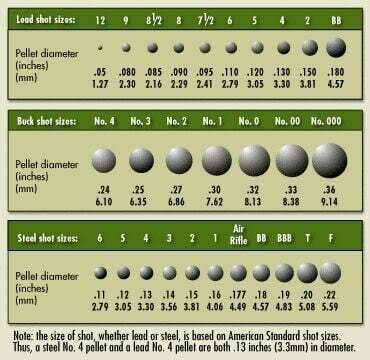 So try a bunch of them out and see what shoots and patterns the best in YOUR shotgun. What did you end up liking the best? Let us know in the comments! Good stuff. I load plain Federal #1 Buck in my 12 gauge and sleep well at night. 32 years in law enforcement, 20 as a firearms and defensive tactics instructor. In the field #1 buck is just as effective as 00 and you get more chances to hit something. Like all weapons it’s not what you’re shooting but where. 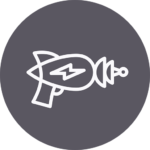 You need just as much aiming and control with the scatter gun as you do with your pistol. Just like there is no magic bullet there are no magic guns. Thanks for the suggestion – I’ve never heard of it before but looking through their website…I would have some issues with it. First would be the fact that they/their marketing team believe that gut shots are humane. One video has them literally shooting the CGI deer in the gut and then bragging about how because of the fragmentation of the round, it will still create a wound channel that barely reaches the tip of a vital organ. That is kind of horrifying to find on a companies website. dduplex been collecting for long time.any of the slugs my choice ,just my opinion.loce all the comments. In the photo lineup, the 16ga and 20ga shells are out of order.